As one of those translators who’s always said, “I love everything about my job except sitting at a desk all day,” I’ve been intrigued for a while by the idea of the treadmill desk. Exercising while you work has been in the news of late, ever since Dr. James Levine, an obesity researcher at the Mayo Clinic, posited the idea that most desk-based workers would lose about 50 pounds a year if they walked at a very slow (1 mile per hour or less) speed while working, rather than sitting in a chair. Levine’s research also showed that most people can do normal office work such as reading off a computer screen, typing and talking on the phone while walking slowly on a treadmill. Here is an article about it from USA Today. Here in Boulder we’re always looking for new ways to exercise; not surprisingly the Treadmill Desk blog is written by a guy in Boulder, and after reading it I got inspired. I fall into the category that fits many home-based office workers; the flexible schedule allows me to exercise enough to stay in decent shape, but on many days, my run or bike ride gets pushed from before lunch to after lunch to the end of the work day to “now it’s time for dinner” and either never happens or is radically abbreviated. Since I don’t have $6,000 burning a hole in my pocket, the commercially produced Steelcase WalkStation wasn’t an option. Based on the advice from the Treadmill Desk blog, I bought a used treadmill for $125 off Craigslist and with the help of two old shelving boards we had in the basement (one to hold my monitors at treadmill eye level, one to put across the treadmill’s arms to hold my keyboard, mouse and day planner), I was in business in about half an hour. So far, I like it. Although the treadmill I bought, a ProForm Crosswalk LS, doesn’t get high ratings for snazziness, it is constructed really well for use with the treadmill desk. For me at least (5’7″), the treadmill’s arm rails are exactly the right height for use with the keyboard, and the treadmill works well at a very slow speed, 0.7 or 0.8 mph, which I turn up when I’m talking on the phone and don’t have to look at the computer screen. On the Crosswalk, I can put my cordless phone in the MP3 player holder and a cup with pens and pencils in the water bottle slot, and it has wide side rails that I can stand on if I need to stop walking for a minute. And it’s amazing how the distance adds up; even at 0.8 miles per hour, if you do that 5 hours a day, you’re already at 4 miles. This is briliiant! You’ve inspired me to look into this more closely. Thanks for the information and the photos. That is a picture of a woman going places if I ever saw one! Corinne, you are an inspiration to us all. I am about to post a new piece on my living the dream blog–another piece on living in harmony. I know there are folks who will say they don’t have time to exercise (a part of the “body” part of living in harmony) and I will send them to this post. The picture tells the story! Thanks so much, I’m so glad you liked it! And I should have said that I typed the blog post while I was walking 0.8 miles per hour! What an excellent idea! I’m going to have to look into something like this as well. -If you go 1 mile per hour or less (and I think you have to have pretty stable eyes and hands to go faster than that while working), you don’t break a sweat at all. People who have to wear nice clothes to work could definitely do this, although I find my treadmill much more comfortable with sneakers than with regular shoes. -I think my typing accuracy and speed are about the same as when I’m sitting down, I don’t notice a big difference at all. I wish I could find a summer job that allowed me to work like this! Thanks, Corinne. I forwarded this to a couple of relatives with back problems. This is wonderful! I’ve heard of this sort of thing, but never actually saw someone in action. Boulder women are on a the fest track…Please, please keep us posted! I need one of those… actually, after my contract is up, I’m going to try to never work a desk job again… but this is a solid plan B.
I’m so impressed at how quickly you put this together (half an hour!) and are making it work! I’d never have imagined it would work for someone who has to read and write a lot. I’ll be following your progress. And I’m curious to see if it makes you more productive by getting those creative juices going in the brain better through improved circulation. 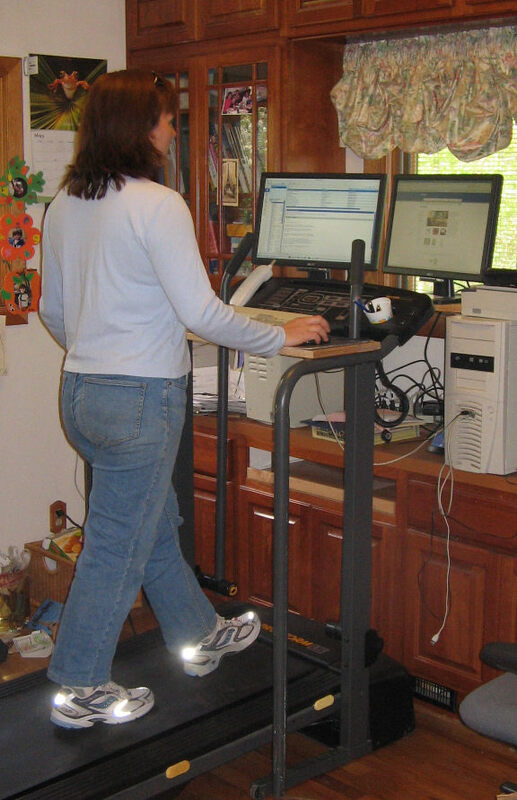 I’d like to invite you and everyone else to join our social network of treadmill desk users at http://officewalkers.ning.com/. What an excellent idea! Congratulations! I absolutely love this idea! I am forever feeling guilty about not making use of my gym membership, but I think I may as well drop the membership and invest in a treadmill for my home office! I guess it’s not so much about losing weight, but staying healthy and active. Excellent idea Corinne! i’m gonna look into this! @Lucy, I completely agree with you. At least here in Boulder, decent quality treadmills pop up on Craigslist fairly regularly and are usually in the $100-$150 range. Even the city recreation centers cost about $40 a month for a membership, so it’s a good deal! I’ll come back soon to read your pleasant words again. Should have known you’d be on top of this issue! I am very interested in how to do this, but the products you could stand to have in an urban shoebox apartment are probably still ten years away. Does your neck hurt from having to look down? Does the light from the window outshine your monitors? Of course, another innovative idea from my friend Corinne! I heard about your cool innovation again from the GLD listserv; you should patent a translator version of this cool thing and come up with a snazzy name! I hooked up my Playstation 3 in front of my long- neglected treadmill, and now I get about 60 minutes of walking (110+ minutes on my days off) every day. I go at 1 mph, it’s a little tricky but I don’t think I am in danger of hurting myself. Been about 3 weeks now, lost 4 pounds. Feel better too. I have wrist weights also. Everyone just be creative. What will motivate you to spend more time on the treadmill? If you like computer games, try what I did. Like movies? Subscribe to something like Netflix and only have a DVD player for the treadmill screen. Like to read? Read on the Treadmill. Hi I came across your webpage by mistake, I was searching for New Designer Fashion when I found your website, I must say your webpage is very cool I just love the theme, its astounding!. I’m in a bit of a rush right now to totally absorb your blog but I have saved the location of it and also signed up for your RSS feeds. I will be back when I have more time. Bravo for a great website. Just wondering, 2 years on, whether you are still on your treadmill, Corinne? I’ve only just found this blog and am fascinated by the idea. @Emma, thanks for your comment! I actually sold my treadmill desk after about a year; I really loved it but we have a small house and I needed the space in my office. I sold it to a friend who is making good use of it, I highly recommend treadmill desks! Yo, was just searching on your web site and decided to load the RSS feed, but it is not working with my webbrowser (I’m looking at it with Google Chrome) any trick to bypass this? Like you, Corinne, I have tried a treadmill desk and find it very useful for writing. See my blog at http://dameditors.ca/blog/. Since the recycled treadmill makes a lot of noise and I am moving to an apartment, I next plan to try a low-tech standup desk. In fact, I expect to set up two of these in my new apartment: one in my office, the other in the kitchen or living room.